Cherrystone Bar Lighthouse was built in 1858. It was a hexagonal screwpile lighthouse built south of Cape Charles, Virginia to mark the channel into the Eastern Shore port. The light had a fourth order Fresnel lens. The light was attacked by rebels during the Civil Was and was reestablished in 1862 by Union forces. The lighthouse was deactivated in 1919. It was replaced with an automatic light that was placed on a steel skeleton tower built on a caisson. The lighthouse was removed in 1920 and shipped by barge to the site of the old Choptank River Light in Maryland. Thus making it the only lighthouse to ever be moved to another site to be used as a working navigational aid. The old Choptank light, which had been destroyed by ice, was removed and replaced with the Cherrystone Light. 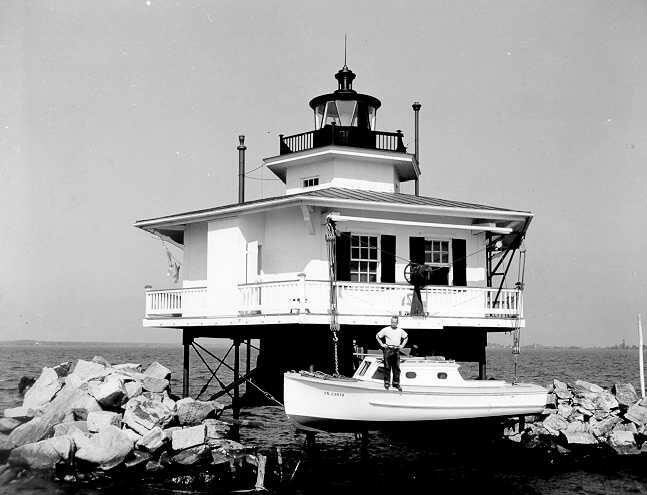 Sometime in 1964 the former Cherrystone Bar Light (Choptank River Light) was dismantled.